NFLX reports earnings next Tuesday and here are some options to consider. 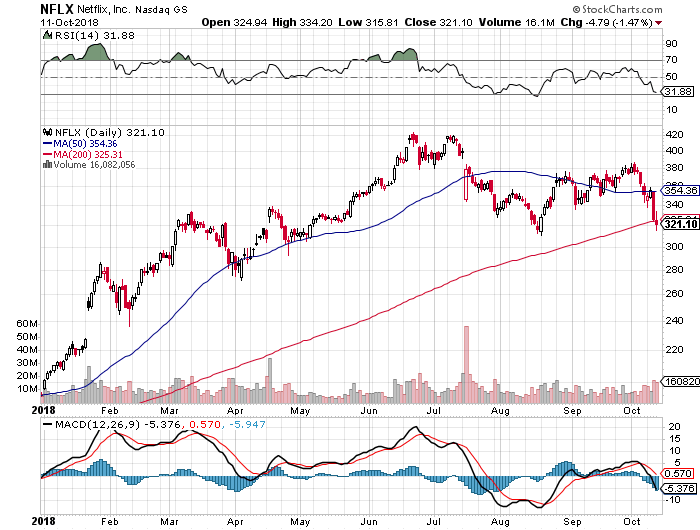 Netflix (NFLX - Get Report) reports this coming Tuesday after the closing bell. As always, market response will be more about both domestic and global subscriber growth, as well as pricing power, than it will be about the fundamentals. There are a couple of ways that a trader could go to make a buck in a dangerous stock like NFLX, in a dangerous market such as this. With a last sale of $321.10, a real daredevil could short $300 October 19 puts at close to a last sale of $10.25, and also short $340 calls at a last sale close to $10.66. Markets move. These prices will be different by the time you read this, but I think you'll get the idea. What this does is expose the trader to having to purchase NFLX at $300, or sell the stock at $340. The trader has already netted more than $20 worth of premiums here, which would be realized profit if the stock remains relatively stable through next Friday, or reduce the trader's net basis by that much if forced into either position. Maybe a more conservative trader might just want to short one $230 October 19 put. Last night, that product went out at $1.11. That's $111 to take on the risk of having to buy Netflix at $230 a week from now. That's down another $90 for a stock already down more than $60 month to date. Of course, if we're wrong, the trader needs to have $23,000 worth of deployable cash or available margin at the ready. What does $111 do? Maybe a nice meal with your spouse. Hey, it's $111, dude.